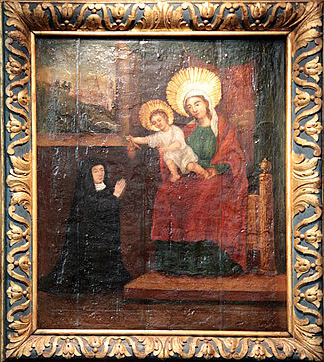 Local tradition holds that a pilgrim to Rome brought the painting of Our Lady of Messina (Sicily) back to Mons. It occupied a shrine in St. Nicholas Church cemetery until the number of miracles and healings there prompted its move into the church in 1622. The picture shows the Virgin seated and on her lap the Christ child, offering a bag to a kneeling nun. (This suggests a story - a convent saved by prayer, perhaps - now lost.) But over the centuries the Virgin's presence in St. Nicholas' remained so compelling that in 1992, the church's name was changed officially to Notre-Dame de Messines. Initially, the city of Mons celebrated Our Lady of Messina on July 2, Feast of the Visitation. In 1771 the celebration moved to March 25, Feast of the Annunciation. On nearest Sunday to March 25, Mons now celebrates the Ducasse de Messines, a festival featuring folk toys and games, food vendors, and dancing "giants." A.E. De Staercke, Notre-Dame des Belges: Traditions et folklore du culte marial en Belgique, Belgium, 1954, cited in www.pastorale-scolaire.net/fondamental/documents/saint_locaux_jld.doc.